If you love food (who doesn't?) and find it hard to push away from the table, think about portion control. As our proven tips here illustrate, you can exercise restraint even as you enjoy your favorite dishes. Our 10 portion control tips—plus four bonus ideas in the sidebar below—will help you avoid stuffing yourself at holiday meals. 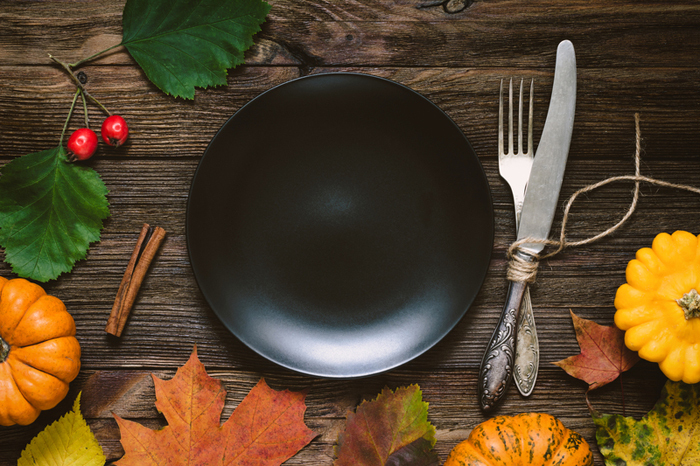 Typically, holidays are the most challenging times of the year to keep from stuffing ourselves: Think turkey, gravy, mashed potatoes, sweet potatoes, sticky buns—all the trimmings that make Thanksgiving special. Portion control often goes out the window. Some experts suggest using a smaller-sized portion-control plate or keeping your meat portion on your plate no bigger than the size of a deck of playing cards (both actually okay suggestions!). But the reality is that we don’t want to be that rigid at fun and festive holiday gatherings. Instead, we need more subtle portion-control tactics. Below, we offer 10 natural ways to ensure that portion control won’t ruin your holiday—or force you into larger jeans. They’re good points to keep in mind, in fact, all year round. 1. Don’t starve to prepare for overeating. While it might seem to save calories, experts agree this is the No. 1 worst thing you can do. It sets you up to overeat, no matter how many other portion-control techniques you use. Simply put: By the time you get to that big holiday dinner, you’re famished. Instead, eat breakfast. Eat a light lunch. Eat veggies as snacks. You’ll have more willpower when you sit down to dinner because you won’t be ravenous. Note: You can plan to eat lighter—again, not starving yourself—on the day before and the day after. 2. Realize that restricted eating backfires. If you really want that apple pie, choose a smaller piece (yes, that’s the very definition of portion control) rather than skipping it completely. One trick, though: If you eat the small piece of pie and immediately want more—which is likely—force yourself to wait. If you’re still desperate for another piece after an hour or so, have another small piece. You also can compromise: Have the pie, but not all the crust. The temptation can be too much, so bring your portion control plan to dinner with you. And have a happy Thanksgiving! 3. Choose a smaller plate. We don’t mean child-like portion-control plates that look like a TV-dinner tray. Just select a smaller plate, like a salad plate. Visually, you’ll feel like you’ve got a heaping pile of food. Think twice, though, about having seconds (there’s always some willpower involved, sorry). Cut your food into smaller pieces and savor each bite. Eat slowly, chew thoroughly, thinking about texture and flavor. This is natural portion control because it’s working with your body. It takes about 20 minutes for your stomach to signal your brain that you’re full. If you eat more slowly, you should realize you’re full before you overeat. Even if the most exciting football game ever is in full swing, you’re better off not eating in front of the TV. Your mind should be on your meal; we tend to eat way more when we’re not thinking about the food. Mindfulness is being completely aware of what you’re doing right at this moment. It’s more frequently used to manage depression, anxiety, and pain, but it’s proven to lower food intake as well. In one study, daily mindfulness was associated with smaller portion sizes of energy-dense foods. Mindful eating, specifically, was even more effective at reducing overall food intake. So, think about that sticky bun while you’re eating it—the color of the glazing, the lightness of the bready part, the effort that went into baking it. See also “4 Portion Control Tips from a Dietitian” at TOPS.org. This one’s a no-brainer. If your mouth is busy talking, it’s spending less time eating. And, trust us on this one, you’ll recall the moments you share with family and friends a lot longer than the food on the table. Yes, it fills you up. That’s the whole idea. Let’s call it liquid portion control. (See also our post “Confused About How Much Water to Drink? A Myth-vs.-Reality Check.“) Note: Verywell.com reminds us that skipping alcoholic drinks is a huge way to save calories during holidays. Psychology Today says the holidays and family gatherings are stressful (no kidding!). Many of us eat to offset anxiety or tension, and it’s usually not vegetables we reach for—it’s the high-calorie sweets and starches. Think about why you’re reaching for that cookie. 10. Incorporate exercise into holidays. Turkey-Trot Runs are good for burning calories before dinner and keeping our metabolism up. That nap after a big meal may not be the best choice—get out and go for a walk instead. From our sister publication Environmental Nutrition, we offer a quartet of extra portion control tips. Use your knife: Studies show that slicing up items… into several smaller pieces decreases food consumption and calorie intake. We tend to think of one piece of food, like a steak or muffin, as an appropriate serving size, regardless of its size. 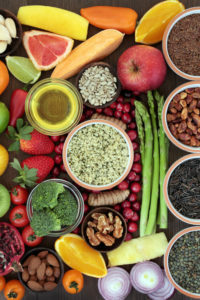 “Slicing foods into several units can trick your brain into thinking you’re eating more than you actually are so you’re more likely to be satisfied with less,” says Lisa R. Young, PhD, RD, adjunct nutrition professor at New York University and author of The Portion Teller Plan. Keep your dining room well-lit. Research from Cornell University found that subjects who dined in a dark room consumed 36 percent more food and were less accurate in estimating how much they consumed than those who ate in a bright room. A bright space can boost alertness to encourage mindful eating, while dimmer lighting may loosen eating inhibitions and mess with satiety cues. Eat slowly. According to a Texas Christian University study, people who ate a meal in 22 minutes consumed 88 fewer calories and felt less hungry than those who cleaned their plates in nine minutes. “Pacing yourself allows time for your body to register satiety signals and prevents calories from adding up without realizing it,” says Dr. Young. antioxidant, anxiety, anxiety and pain, brain, breakfast, calories, depression, depression anxiety, energy dense foods, exercise, food, health, health news, healthy eating, healthy pumpkin pie, healthy pumpkin pie recipe, how much water to drink, manage depression, metabolism, mindful eating, mindfulness, nutrition, overeating, pain, portion control, portion sizes, potatoes, pumpkin pie recipe, recipe, serving size, studies show, university health news, vegetables, weight gain. This post Portion Control: 10 Tips to Keep from Overeating is very helpful for compulsive eating plan! I wanna share the article to my private blog?